Pablo Atchugarry was born in Montevideo, Uruguay, on 23 August 1954. His parents, Maria Cristina Bonomi and Pedro Atchugarry Rizzo, passionate art enthusiasts, identified Pablo’s artistic talent and interest when he was still a child and encouraged him to pursue a career as an artist. In his earliest works, he expressed himself through painting, gradually discovering other materials such as cement, iron and wood. In 1971, his first cement sculpture was entitled Horse; this was followed by other cement and iron sculptures including Escritura simbólica (1974), Estructura cósmica (1974), Metamorfosis prehistórica (1974), Maternidad (1974) and Metamorfosis femenina (1974). In the late 1970s, after taking part in several exhibitions in Montevideo, Buenos Aires, Puerto Alegre and Brasilia, Atchugarry made a number of trips to Europe to study and perfect his art. He travelled to Spain, France and Italy, where he mounted his first solo exhibition in Lecco in 1978. His paintings were subsequently exhibited in a variety of European cities, including Milan, Copenhagen, Paris, Chur, Bergamo and Stockholm. After experimenting with a range of different materials, in 1979 Atchugarry discovered the extraordinary elegance of marble and he carved his first sculpture in Carrara, entitled La Lumière. His first monumental sculpture carved from Carrara marble was completed in 1982. That same year, the artist settled permanently in Lecco, working on the sculpture La Pietà, carved from a single block of marble weighing 12 tonnes. In 1987, he held his first solo sculpture exhibition in Bramantino’s Crypt in Milan, curated by Raffaele de Grada. Late 1996 saw the installation of the sculpture Semilla de la Esperanza in the monumental sculpture park in the grounds of Uruguay’s government building. In 1999, the artist founded the Museo Pablo Atchugarry in Lecco to house works spanning his entire career alongside bibliographical documentation and an archive. Twenty years after his arrival in Italy, the Province of Milan organised a retrospective of Atchugarry’s work entitled "The Infinite Evolutions of Marble" at the Palazzo Isimbardi in Milan. In the same year, he sculpted his first monumental work entitled the Obelisk of the Third Millennium, a six-metre-high Carrara marble sculpture for the Italian town of Manzano (Udine). He also won the competition to created Lecco’s Monument to the Culture and Civilisation of Work, a sculpture in white Bernini marble also six metres high and weighing in at 30 tonnes. 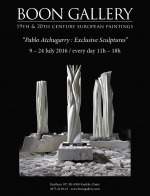 In 2002, Pablo Atchugarry was awarded the "Michelangelo" prize in Carrara in recognition of his career as an artist. He was also committed to a range of projects that year, including the Ideals sculpture, which stands on Avenue Princesse Grace in Monaco and was created to commemorate the 50th anniversary of the coronation of Prince Rainier. In 2003, he participated in the 50th Venice Biennale - International Art Exhibition with the sculpture Soñando la paz, a work consisting of eight pieces, five in Carrara marble and three in Bardiglio della Garfagnana marble. Also in 2003, he sculpted Ascension for the Fundació Fran Daurel in Barcelona. In 2004, he carved Vital Energy, a Portuguese pink marble sculpture for the Bellinson Center in Petah Tikva, Israel, and the following year the National Museum of Fine Arts in Buenos Aires staged an exhibition of his work. From June to November 2006, the Groeningemuseum in Bruges, Belgium held a major retrospective exhibition of the artist’s career, including works from international private collections; in the same year, the Museu Coleção Berardo in Portugal acquired Vital Path. In early 2007, Atchugarry opened the Fundación Pablo Atchugarry in Manantiales, Uruguay, with the aim of providing a stimulus for the arts and creating a place for artists of all disciplines to meet in an ideal location that combines nature and art. In the same year, he completed an eight-metre-high monumental work In the Light, carved from a single 48-tonne block of marble, for the Collezione Fontana in Italy. In 2007-2008, a retrospective exhibition dedicated to his work entitled The Plastic Space of Light was held in Brazil, accompanied by a critical text written by Luca Massimo Barbero. Initially staged at the Banco do Brasil Cultural Centre in Brasilia, the exhibition travelled to the MuBe (Museu Brasiliero da Escultura) in São Paulo and the Museu Oscar Niemeyer in Curitiba. In 2008, the Museo Nacional de Artes Visuales in Montevideo dedicated a retrospective exhibition to Atchugarry’s work of the preceding 15 years. 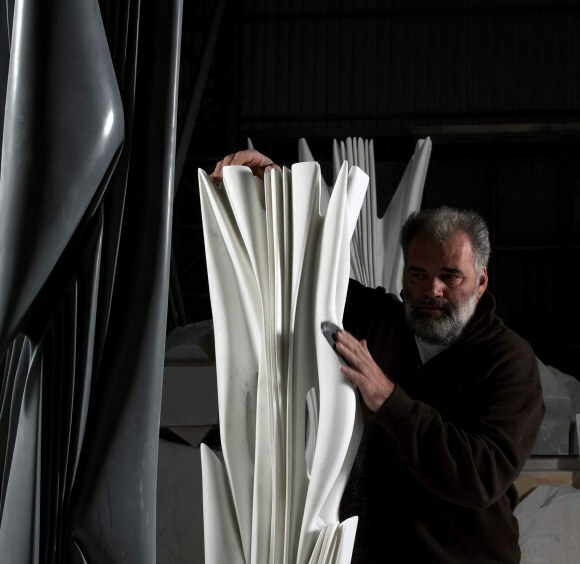 In 2009 Atchugarry created the work Luz y Energía de Punta del Este, carved from a single five-metre-high block of Carrara marble, for the hundredth anniversary of the city of Punta del Este. In 2011, after seven years of work, he completed Cosmic Embrace, carved from a 56-tonne, 8.5-metre-high block of marble, and the same year the Hollis Taggart Galleries in New York organised a solo show, curated by Jonathan Goodman. In March 2012, the Times Square Alliance association selected Dreaming New York to be exhibited in Times Square during The Armory Show Art Fair in New York City. In April 2014, the 8.35-metre-high Carrara marble sculpture Movement in the World was installed in the town of Kallo-Beveren, Belgium. In late 2013, Mondadori Electa published the Catalogo Generale della scultura, two volumes edited by Professor Carlo Pirovano cataloguing every sculpture produced by the artist between 1971 and 2013. From July to September 2014, the Museu Brasiliero da Escultura in São Paulo, Brazil dedicated a major retrospective to the artist’s work, entitled "A Viagem pela matéria". The exhibition "Eternal City, eternal marbles", featuring 40 sculptures, will be exhibited at the Museo dei Fori Imperiali - Mercati di Traiano in Rome from 22 May 2015 to 7 February 2016. Pablo Atchugarry’s works have also been exhibited at the following museums and public institutions: Museo Nacional de Artes Visuales, Montevideo; Museo del Parco, Portofino; Museo Nacional de Bellas Artes, Buenos Aires; Museo Lercaro, Bologna; Collezione della Provincia di Milano a Palazzo Isimbardi; Collezione della Provincia di Lecco; Fundació Fran Daurel, Barcelona; Groeningemuseum, Bruges; Museu Coleção Berardo, Lisbon; Pérez Art Museum, Miami; The Patricia & Phillip Frost Art Museum, Miami; Chrysler Museum of Art, Norfolk; Museo Brasilero da Escultura, São Paulo. Atchugarry currently lives and works between Lecco and Manantiales, where he oversees the development of the Fundación Pablo Atchugarry and the international monumental sculpture park, as well as teaching and promoting art.